With the help of President George H.W. Bush, Bass Pro Shops and representatives of the States of Texas and Florida, RBFF and the George H.W. Bush Vamos a Pescar™ Education Fund has announced the very first grant donations to organizations bringing conservation, education and fishing and boating experiences to Hispanic families. 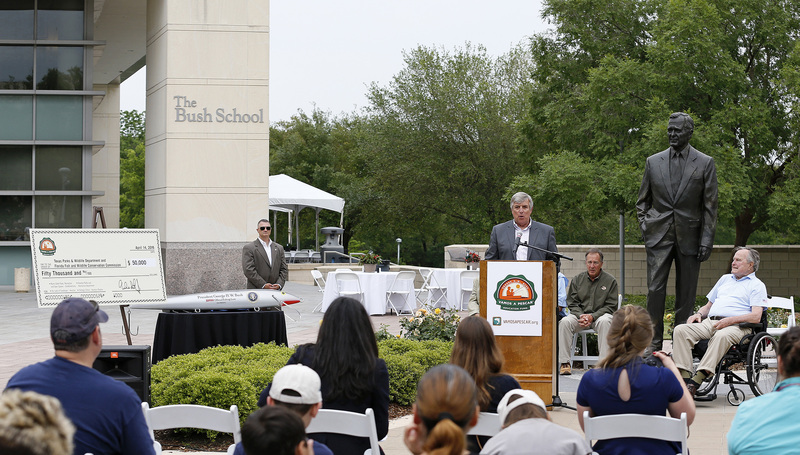 A total of $50,000 in grants were awarded last week during a ceremony at the George Bush Presidential Library and Museum in College Station, TX. The George H.W. 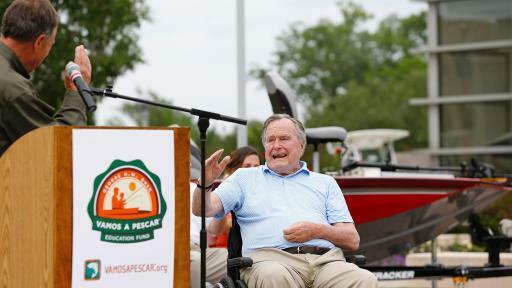 Bush Vamos a Pescar™ Education Fund was founded by RBFF in 2014, with an initial $125,000 donation by Bass Pro Shops Founder and CEO Johnny Morris, in honor of President George H.W. Bush’s milestone 90th birthday. 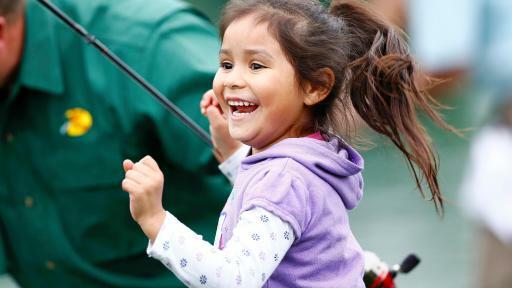 The mission of the Education Fund is to bring hands-on fishing and boating experiences, along with conservation activities, to Hispanic families across the United States. This event announces the first grants made in furtherance of this mission. Hispanics currently make up 17 percent of the U.S. population (54 million), and are projected to grow to 20 percent of the U.S. population by 2020. 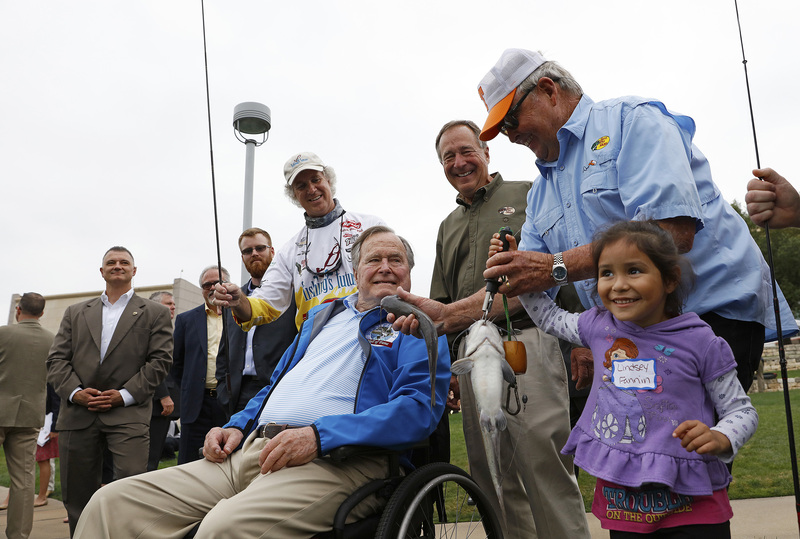 Out of 46 million total anglers, 3.3 million are Hispanic, representing only 7 percent of all anglers in the U.S.
To celebrate the announcement, local families and members of the community participated in fishing activities and a fun-filled fish fry at the April 14 event. 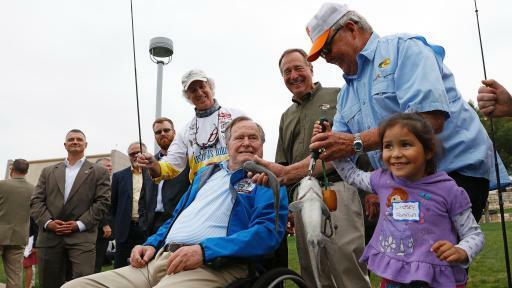 In addition, Johnny Morris, Bill Dance and Pedro Sors presented President Bush with a Bass Fishing Hall of Fame jacket and plaque in recognition of his recent induction into the Bass Fishing Hall of Fame. These organizations will use funds to organize fishing and boating trips that will be held in areas that are easily accessible and regularly stocked with fish. Participants will receive skills training on basic fishing, boating and water safety. 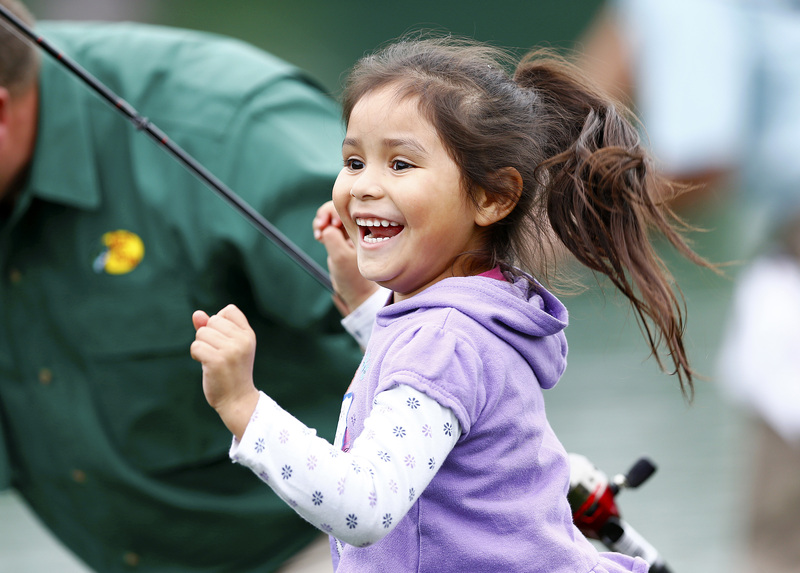 A 2016 Vamos A Pescar fishing event at Tropical Park in Miami that introduces families to fishing, boating and environmental education programs, and improves upon 2015 efforts. The continuation of Fishing and Boating Safety Camps held at various locations throughout the county. 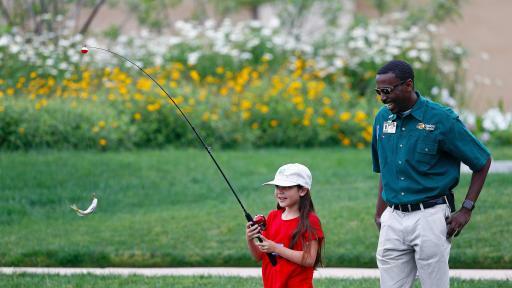 A series of Family Fishing Workshops throughout the county where kids and families can spend time together, learning fishing from trained instructors and acquiring a respect for the outdoors. “We are committed to helping Florida’s families and youth fully enjoy healthy outdoor activities such as fishing and boating. Participating on a high school fishing team is a great way for teenagers to learn more about conservation and boating safety. 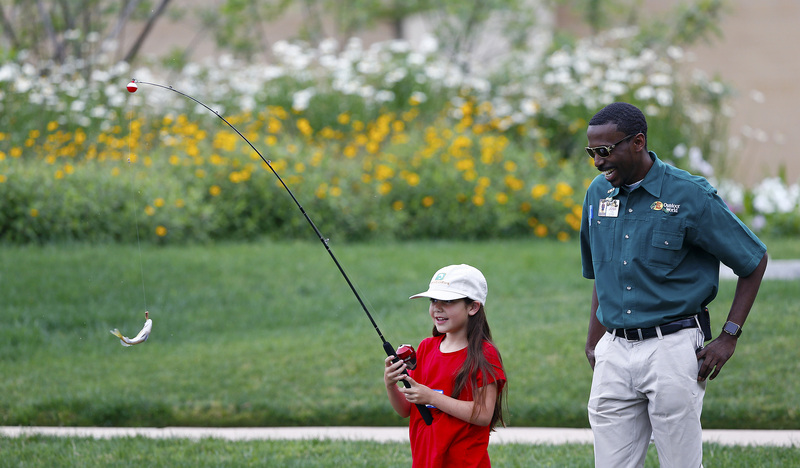 We are grateful for this opportunity to expand high school fishing within our highly-diverse communities of Florida,” said Nick Wiley, executive director of the Florida Fish and Wildlife Conservation Commission. 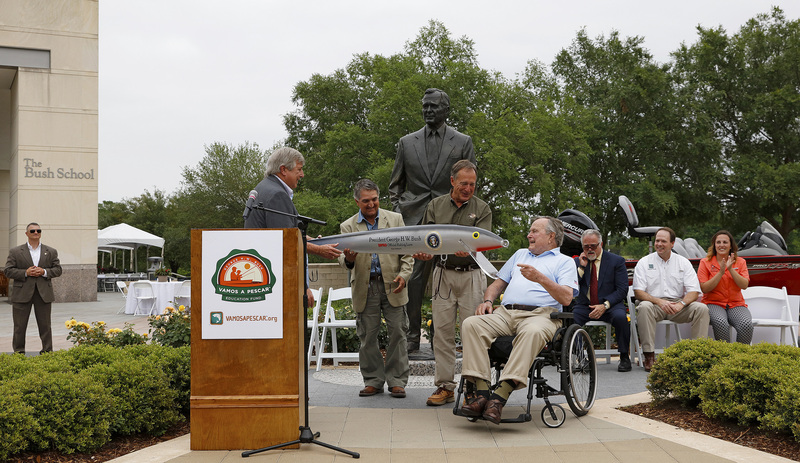 More information about the George H.W. 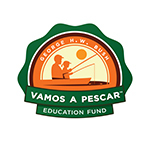 Bush Vamos A Pescar™ Education Fund is available at http://www.takemefishing.org/educationfund/. For information on how to contribute to the Fund, please contact RBFF Senior Manager of Strategic Partnerships Rachel Auslander at rauslander@rbff.org. 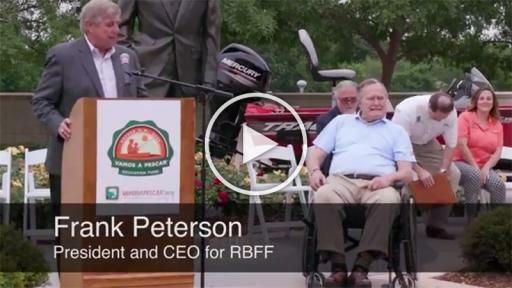 RBFF is a nonprofit organization whose mission is to increase participation in recreational angling and boating, thereby protecting and restoring the nation’s aquatic natural resources. RBFF developed the award-winning Take Me Fishing™ and Vamos A Pescar™ campaigns to create awareness around boating, fishing and conservation, and educate people about the benefits of participation. Take Me Fishing and Vamos A Pescar help boaters and anglers of all ages and experience levels learn, plan and equip for a day on the water. The campaign websites, TakeMeFishing.org, and VamosAPescar.org, feature how-to videos, information on how to get a fishing license and boat registration, and an interactive state-by-state map that allows visitors to find local boating and fishing spots. The George H.W. 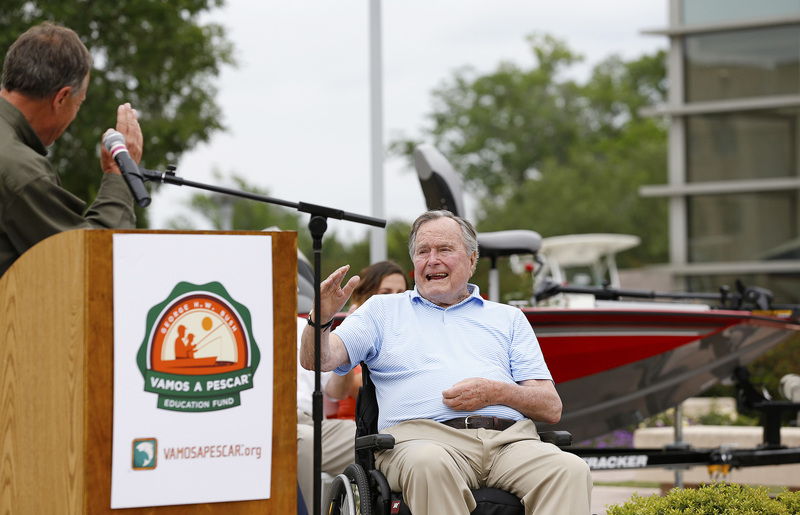 Bush Vamos A Pescar™ Education Fund was created by RBFF with an initial donation of $125,000 from Bass Pro Shops Founder and CEO Johnny Morris to bring conservation, education and fishing and boating experiences to Hispanic families in key metro areas of Texas and Florida. With the help of similar donations from other individuals, companies and associations, the fund will help educate and engage Hispanic and multicultural audiences throughout the United States in boating and fishing with the support of RBFF’s Vamos A Pescar™ Hispanic outreach initiative.